Dion Data is a legitimate data management service bureau who hires home contractors for work at home data entry. They've been around since 1999. How much does Dion Data pay? There is no public pay rate available for this company. However, I did discover that Dion Data pays per piece/document rather than per word or keystroke as many other data entry companies do. How often does Dion Data pay and what method do they use? As of 2007, Dion Data paid their workers once every two weeks with a paper check. No idea if this is still the case, but that's the most recent info I could find. Would really appreciate it if anyone who has worked for this company recently could update me on this if it has changed! What are the requirements to work for Dion Data? You have to be able to type at least 60 words per minute and have a good understanding of how to use computers for basic things like navigating the Internet, emailing things with attachments and downloading files. Dion has an application on their website you can download and fill out. They just want to know basic information about you as well as a little about your past work history, country of residence, and your typing speed. They get a lot of applications and state that they cannot respond to all of them. You are free to apply again with this data entry company if you haven't heard back from them in a month. Does Dion hire workers who live outside the United States? When you apply, you must state if you're a U.S. citizen and whether or not you're legally eligible to work in the U.S. if you're not a citizen, so I'm guessing they do. You just have to be able to work here legally. What do other people say about working for this data entry company? Other people really seem to like the job, and I think the fact that they hire so rarely is a good indicator that they have a low turnover rate. Most workers seem satisfied with pay, although the rate isn't publicly available. I can find almost no negative comments about working for Dion Data, which is a rare thing. 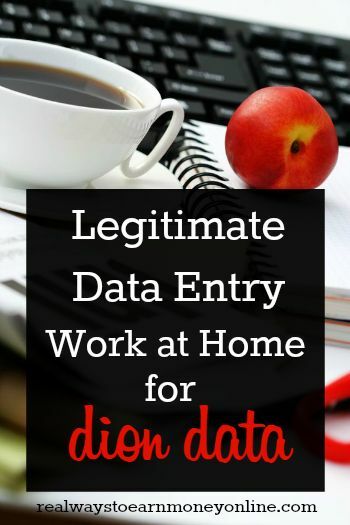 There are lots of other data entry companies out there, many with poor feedback. Is applying to Dion Data worth it? If you want to do data entry, I think it is worth it. However, don't get too discouraged if you don't hear back immediately — just apply again. Many people apply every year with Dion Data and finally manage to make it, and there are also people who apply and hear back ASAP. So you never know! But yes, I think it's very much worth your time to apply here if you want to do this sort of work. Visit Dion Data's website to learn more about the company and get started on your application. Looking for companies hiring right now for data entry? If so, I recommend getting a membership at FlexJobs. They post hundreds of new work at home job leads from reputable companies every day, and they 100% guarantee against scams. I have been a member for a few years now, and I've found it to be a very helpful site. It's about $14.95 monthly to join, but you can set your account up so it only bills you for that first month if you just want to try it for a month and see what you think. The fee is in place because, unlike other work at home job search sites that are free to access, they do not display advertisements that often annoy readers, so they charge a fee instead to generate income and get compensated for their efforts. If you decide to sign up, use promo code AFFILPROMO to get 30 percent off the price! Good luck! And if you have tried out Dion Data or any other data entry company, please comment below and let us know how it went. Originally published on March 28, 2011. Updated and re-published on February 16, 2018. Hello Everyone! DionData Solutions is now hiring for Independent Contracted Vendors who are Experienced Data Entry Operators. Must key 60wpm. Win XP, 7 and 10 Pro Editions are required. Familiar with Virtual PC is a plus. Flexible schedules. Have 24/7 projects. Start immediately! You sign a Non-Disclosure/Non-Compete during the hiring process. That is why you do not hear about or see much of the info you seek in forums. This is your business as a Vendor for us so it is taken very seriously! Pay is based upon how much time and effort you put into your business. It varies for each individual. Since we do have that low turnaround we seek individuals who are willing to put in the time and take pride in their work. That person could be you. Thank you, Diane Dion – Sr. V.P. I see that I need to provide my AOL IM login on the application. I see that AOL IM was discontinued in December, 2017. I was directed to AIM Express, which leads me to the AOL site, where I signed up for a free AOL account. However, I see nothing about chat. Please assist. Thank you. We have updated applications on our website. We are currently using Yahoo IM. I just submitted my application. I’ve been trying for years so hopefully this time I’ll get lucky!!! Words or characters per minute and just work more hours in a day to get the required amount of work done? Other than that, everything else sounds good. As long as you meet the turn around. What is their pay per minute? I applied yesterday. Their application looks to be an ancient document you must download and open on MS Word. It is poorly formatted. I don’t have Word, so I had to convert it to an .odt file. Apart from that, they just want to know the basic stuff, like your past jobs and how many WPM you can type. Weird, it says you must have Windows XP. I wonder if they mean At LEAST. Like Win7, 8, or 10 is also okay? And I wish I knew what the pay was. It’s like some huge secret! Yeah, my guess is they just haven’t updated their hiring page in a LONG time! I would also like to know what pay is. Applied a week ago and was offered work yesterday. Getting geared up for set up instructions and testing live. Given my prior data entry exp (production) over the last 20 years, was a huge advantage. Understand pay is solely based on piece pay per document. But assume this is confidential and quoted at time work is cleared. Excited to finally be able to work from home. It has been on my bucket list for a long time. Hi, Lisas – I’m looking to do some work from home to supplement my income. What did you find out about this company, and can you offer anything about pay, ease-to-do-business with, etc.? Hi Barb, We are currently hiring all shifts for a 24/7 on-going project. Please return to our website and apply. Please list this site when asked where did you hear about us. Thank you, Diane Dion, Sr. V.P. Has anyone got hired for this company? I applied and i’m waiting on a response. Hi Anna! I came across your blog through Pinterest I believe. This is a pretty old post but I decided to check Dion out and submit my application. I received a response a few hours later that they want me to start working for them. Hi Alicia, I am wondering if you still work for them and would update your post to include a review of how it is to work for them as I am considering it? Thanks so much. And thanks Anna for your information on data entry jobs. I just discovered your blog and have been enjoying the information. Thanks, I’m so glad you’re finding it helpful! How much do they start off as a stay at home vendor data entry at Dion Data Solutions? Just went to their website. They stated that they are not accepting any vendor applications after 12/1/12. Does anyone know if they are now accepting apps? I’m not sure Marion, but it doesn’t hurt to apply and see what happens. Unfortunately, I’ve never heard of anyone getting hired by this company. I applied myself over a year ago and haven’t heard back. But it never hurts to try. I’ll give it a shot. I type 90 wpm and I enjoy data entry and word processing. I’ll report back. Patt – I can’t speak for anyone else, but I applied a LONG time ago and have still not heard back. I also type extremely fast. I am seriously beginning to wonder if this company is still in business or if they just absolutely never have a need for employees. Their site says they are hiring now, but you must type 60 wpm with accuracy.